Report 2: Occupation is "An Ongoing Terror"
November 5, 2012 - Interfaith Peace-Builders (IFPB) is pleased to announce that our 21 member delegation to the Gaza Strip passed safely through the Rafah Crossing Monday morning and is now safely in the Gaza Strip. Interfaith Peace-Builders has sent more than 44 delegations to Palestine/Israel since 2001. This is the first IFPB delegation to enter the Gaza Strip since 2003. Like other IFPB delegations, its purpose is to educate North Americans about the region and deepen their understanding of its conflicts. On the eve of the Presidential Election in the United States, the US-brokered peace process continues to show few results and US military aid to the region continues to flow unabated. This delegation focuses on the realities of Palestinian life in the Gaza Strip. Participants have the unique opportunity to hear directly from Palestinians throughout the territory regarding their hopes for peace and the role of the United States, the US government, and other international actors, in promoting a resolution to the conflict. 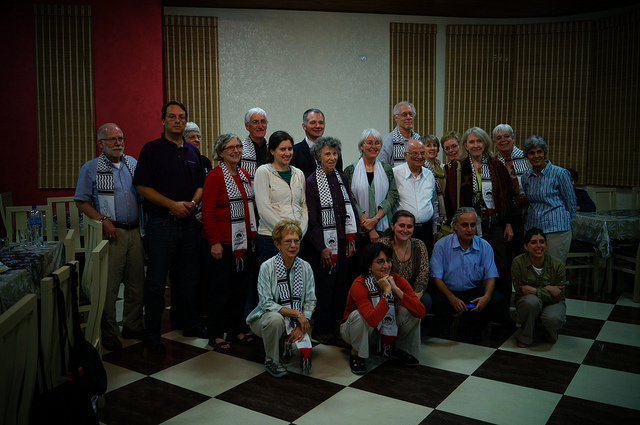 The Interfaith Peace-Builders delegation to the Gaza Strip is led by Michael Brown and Cindy Corrie. Michael Brown worked off and on in the Gaza Strip between 1993 and 2000 for the Gaza Community Mental Health Programme and the Palestinian Centre for Human Rights. A former IFPB board member, Michael continues to work today on the media and Palestine. Michael led an IFPB delegation in 2008. Cindy Corrie is the mother of human rights activist and observer Rachel Corrie who on March 16, 2003, was killed by an Israeli military Caterpillar bulldozer in the Gaza Strip. Motivated by her daughter's work and sacrifice, Cindy Corrie has dedicated herself to the pursuit of justice and peace in the Middle East and has visited Israel, the West Bank, and Gaza on numerous occasions. She is also president of the board of the Rachel Corrie Foundation for Peace and Justice, inspired by her daughter. In addition to the reports linked from this page, IFPB delegation participants may be blogging and tweeting about their experiences. Like the trip reports posted here, individual blogs and tweets reflect the views of delegation participants only, and not necessarily Interfaith Peace-Builders or partners. Media interested in interviewing the participants when they return, and groups wanting information about speaking engagements, should contact Interfaith Peace-Builders at media@ifpb.org or 415.240.4607.